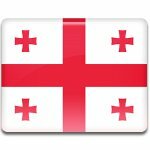 April 14 is Day of the Georgian Language. It has been celebrated since 1990 in commemoration of demonstrations against changing the constitutional status of languages in Georgian SSR that took place in 1978. In 1977, a new Constitution of the Soviet Union was adopted. Afterwards, Georgian Supreme Soviet drafted a new Constitution of the Georgian SSR, in which Georgian was no longer declared to be the sole official language in the republic. The Soviet authorities made an attempt to give an equally official status to the Russian language. This unpopular move led to mass demonstrations throughout the country, that reached their climax on April 14, 1978. Thousands of people, primarily university students and intellectual, protested on the streets of Tbilisi. Following the unprecedented protest, Soviet authorities had to abandon amendments to the constitution concerning the status of languages in Georgia. Since 1990, April 14 has been celebrated as Day of the Georgian Language. Although it is not an official holiday, it has been widely celebrated throughout the country ever since. The Georgian language belongs to the Kartvelian (Iberian) language family, which is indigenous to the Caucasus, and has its own unique writing system.